RW Head Guide, Ken Fuhrer, shot this photo earlier today while leading a group of hikers on the Zermatt & Saas Fee Flex Tour. Of all the mountains in Switzerland, the Matterhorn, also known as Monte Cervino (Italian) and Mont Cervin (French), is probably the most famous and recognizable. Its distinct pyramidal shape draws visitors from all over the world and offers a stunning backdrop above the alpine resort village of Zermatt. 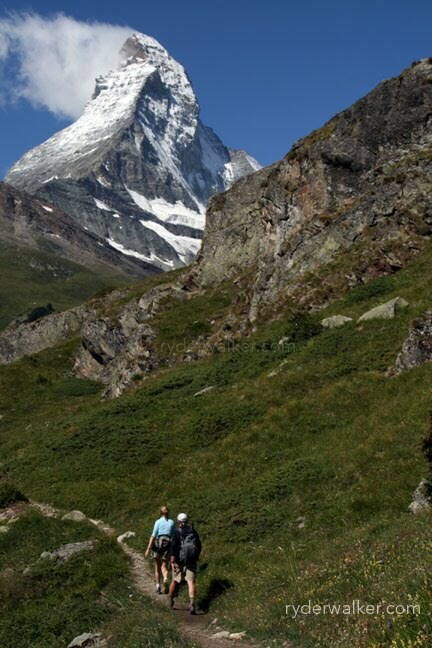 Note: The prominent ridge running up and to the right on the front of the Matterhorn is called the Hörnligrat. The Hörnli is one of the most frequented climbing routes to the summit.